Mobile Torchworking Studio | The T.O.A.D. 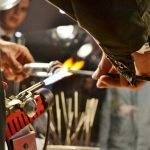 Sonoran Glass School’s mobile torchworking studio provides exciting glass art demonstrations and experiences for events, gatherings, and special occasions. The T.O.A.D. (torchworking on a dolly) is available for public and private settings. Demonstrations are entertaining and educational in nature. 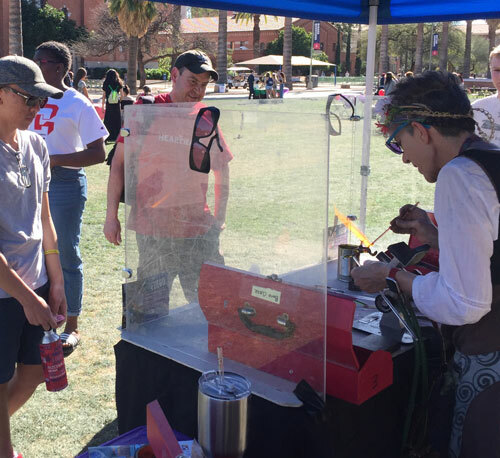 Past appearances include glass demos at the Cup Cafe’s 25th Anniversary, The Children’s Museum Tucson, The Tucson Museum of Art, Flandrau Planetarium, the University of Arizona Art Department, The Ritz Carlton and others. Sonoran Glass School’s T.O.A.D. 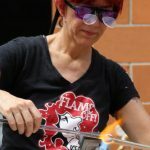 also offers Make Your Own Glass Art Experiences, where guests can design and help make a piece of glass art alongside an experienced instructor. Projects include ornaments, pendants, beads, drink stirrers, and other pieces. No experience necessary. Pricing starts at $600 and includes up to three hours of demonstrations and/or instruction. Each additional hour after that $90/hour. Total price varies by the number of hours, demos, and make-your-owns. To make the T.O.A.D. part of your unforgettable event, email Bronwen or call at 520-884-7814. 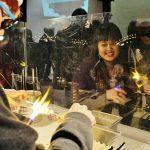 Optional Make Your Own Glass Art projects can be paid for in advance or at time of service by participants. Proceeds support this program and cover the costs of transportation, setup, staffing, and glass materials used during the demonstrations.